I am attempting to reread 10+ books in 2016 that I have rated highly in the past. I am not attempting to second guess or denigrate my younger self in any way but am wanting to compare how my tastes have changed and possibly matured. I am certainly much more widely read now [both in the good and bad quality sadly] than then. I will hopefully be going into the reasons for any differences of opinions between then and now. If there is no difference of opinion, then it was a hellfire’d fine book! Links may link to either WordPress, Booklikes or Blogspot, depending on when the original review was. Just as Ethan and Skua are getting ready to leave Tran-Ky-Ky, Ethan gets suckered into taking a job for his company as the Representative for the world, meaning that he has to stay on Tran-ky-ky.
At the same time, some egg heads on station find an anomaly in the weather, which upon investigation, shows that the whole of Tran-ky-ky is in danger. With the help of Ethan, Skua, Milliken, the Slanderscree and the eggheads, that danger is proven to be man made. Mad scientists, renegade Tran, a melting world and the genocide of an entire species. Has Ethan stepped in it or what? The weakest of the trilogy, unfortunately. My Review from ’05 pretty much nails the story line. This just felt worn and old. While Icerigger excited me even upon my latest re-read, this didn’t excite me at all. I certainly have no desire to ever re-read this again. The shallowness of the characters really shows up here. In fact, this is exactly like the Magic Kingdom for Sale/Sold series by Brooks. First book is great, but since all the characters are cardboard, that flaw shows up in greater detail in each successive book. Problem is, to get deeper characters, you’d seriously up the page count and the plot couldn’t handle that. Now, that doesn’t mean this was a bad book. It was just a generic SF book that was written for pure entertainment and absolutely nothing else. It fulfills that mission quite admirably. And back when it was written in the 80’s that was all we as readers were looking for. The tome-meisters hadn’t gotten on the scene yet and publishers wouldn’t have published them anyway. Good to finish up the storyline and that was about it. Read it and forget it. Having survived Tran-ky-ky for a year, Ethan Fortune isn’t that keen on going right back to his planet to planet sales job. He does refuse Collette DuKane’s proposal of marriage but more because he realizes that he’ll resent her power and constant on-the-go lifestyle than because she is fat. This book is about Ethan, September, Milliken, Hunnar and the Slanderscree trying to put together a Trannish coalition so that Tran-Ky-Ky can be given membership into the Commonwealth. Unfortunately for them, greedy humans, self-serving tran and one particularly insane tran, stand in their way. On their journey, they discover information that makes it imperative that Tran-Ky-Ky joins the commonwealth, for the good of all Tran the world over. 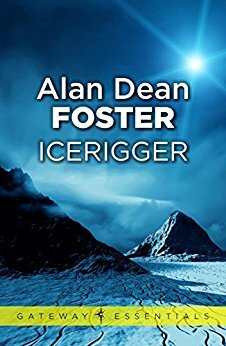 This was much weaker than Icerigger both in terms of adventure and interesting characters. The already existing characters are pretty static and the new characters who show up are there to either cause problems, be killed off or act as allies, nothing more, nothing less. On the adventure side of things, it just didn’t grab me the same way. There is a battle at Moulokin that wasn’t nearly as good as the battle between the Horde and the Settlement in Icerigger and the Slanderscree’s overland journey didn’t nearly match up to the journey to Brassmonkey from the previous book. There is still a lot of action, it just wasn’t as good. I can’t pin it down any further than that, sadly. Overall, while I enjoyed this read and am glad I made it part of my Project Reread, I don’t think I’ll be reading it again. It is time to let this sit and relax with all the other books I’ve read. Links may link to either Booklikes or Blogspot, depending on when the original review was. Ethan Fortune, traveling space salesman, interrupts a kidnapping and is taken along for the ride. The little kidnapping craft crashes and the kidnappee’s suddenly out number, out bulk and out gun their lone kidnapper. Sadly, they’ve crashed on Tran-Ky-Ky, the Hoth of the HumanX commonwealth, where metal is rare, the natives furry and the group is 1000 of kilometers from the only humanx outpost on the world. After being rescued by a group of friendly natives, you’d think the groups’ problems were over. Nope. It appears that they have arrived just as the locals are rising up against the Horde, a nasty group that sails around taking tribute and causing mayhem. Lots of adventures happen and the book ends with the Slanderskee, an ice rigger [hence the name of the book and trilogy], skating into Brass Monkey, the humanx outpost. If was I reading this for the first time, I’d be hesitating between 3.5 and 4 Stars. There are several things that you could nitpick about. My main one was where was the security detail for the Du Kanes? Heads of businesses that are multi-bajillionaires don’t wander around by themselves. However, since this is my 5th or 6th time reading this, I’ve obviously gotten past that. This is another book that I read multiple times in highschool, at least once or twice in bibleschool and then again since 2000. And now. When I read this back in ’06, I started looking for a hardcover edition. I managed to buy one recently [ie, in the last couple of years] for under $100, but before that, the price had ranged from $150 to $450. OUCH. This was fun. Ethan is a good face for the group. Being a salesman he’s used to dealing with disparate groups of beings and is mentally flexible enough that a little thing like being stranded on an ice planet doesn’t make him panic and freeze [ha, wordplay totally intended there]. Skua September is the mature, wise, warrior elder. Ok, maybe not quite so wise or mature but he definitely provides that “experience” vibe that Ethan certainly doesn’t have. Then the “scientist’y” teacher who fills in all those science’y parts necessary in an SF book. Finally, there are the Du Kanes. The sometimes senile, sometimes not, father and then Collette, the smart as a whip, really running the business but a dutiful and loving daughter. Who can only be described as fat. Foster pulls no punches whatsoever in regards to Collette. In some ways it is rather shocking to see how she is treated so bluntly, but I never felt like it was used as a comedic “hey lets make fun of the fat girl” kind of thing. She is not a princess but is expected to fill a princess’s role and that conflict brings a bit of gravity to this otherwise pretty light novel. Once again, this was a smashing success for my Project Reread.